Occupation isn’t a tactic that started this fall. In 1932 US military veterans of the Great War (now World War I), facing a job market even worse than today, demanded that the Federal government pay them their promised bonuses–no more than $1,000–early. A bill providing for an early payment of the service bonus was stalled in Congress. Veterans looked for a way to push the issue. Across the country, groups of veterans started separate marches to Washington, D.C. to make their claim, staging parades along the way. Other vets joined them in Washington, riding freight trains, hitchhiking, and organizing car caravans. Ultimately more than twenty thousand veterans would converge on the Capitol. The first three hundred marchers reaching Washington by the end of May 1932, followed by thousands more. President Herbert Hoover and District of Columbia Police Superintendent Pelham Glassford welcomed them with a warning against associating with Socialists and Communists. 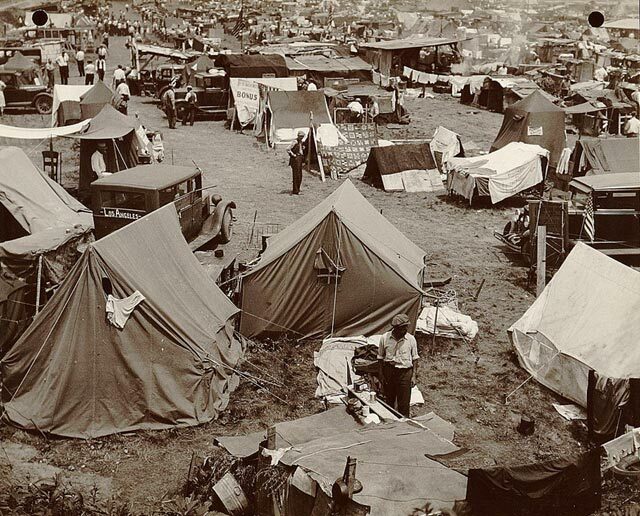 Superintendant Glassford, a veteran of the war, met frequently with the protesters, and arranged for a safe campground in Anacostia, across the Potomac River. He also helped the marchers set up their camps and raise money from local merchants to feed the marchers. The Bonus Marchers asked him to serve as their “secretary-treasurer,” and he agreed, even as he secured tear gas for the police–to protect the Capitol from the veterans. On June 7, the Bonus Army, comprised of veterans of diverse backgrounds, including the decorated and the disabled, marched. They emphasized their service, their patriotism, and their discipline, winning some support from Congress and the press. Implicitly, they also emphasized their desperation: men with jobs could not spend months traveling to the Capitol and camp out on lawns to demand a relatively small cash payment. They also lobbied Congress. On June 17 the Bonus Army gathered outside the Capitol while the Senate overwhelmingly (62-18) rejected the Bonus Bill. The veterans marched back to their encampment peacefully, but refused to leave the city, and more veterans continued to arrive. At Camp Anacostia, they welcomed some families into their camps, advertising the presence of women and children within their ranks. Some organizers traveled to other cities on the East Coast to raise money to feed the marchers. As with Occupy, the long encampment produced tensions among the demonstrators and with the police. By the end of July, as Congress prepared to adjourn its legislative session, authorities grew more determined to clear the veterans out of the city. Local and national officials issued eviction orders to the encamped veterans. On July 28 the US Army, led by General Douglas MacArthur, overran the camps, using tear gas and burning the protesters’ shacks. A few of the veterans fought back by throwing rocks, and MacArthur suggested that Communists had hijacked the veterans’ campaign–and that some of the men weren’t even veterans. (These charges turned out to be false.) Using fire, bayonets, and tear gas, he routed the marchers from the Capitol. In November 1932, Franklin Delano Roosevelt defeated President Hoover in a landslide. Bonus Marchers reappeared just after he took office, in early 1933. President Roosevelt arranged for lodging, food, and bathrooms at an army post in Virginia, and met with a delegation of Bonus Marchers in the White House. Roosevelt initially resisted paying the bonus, but offered the veterans priority for employment in the newly established Civilian Conservation Corps; by 1936, he agreed to pay the bonus as well. Occupation isn’t new. It’s provocative, potentially effective, and authorities have a hard time finding a balance between reaction and overreaction. The Bonus Marchers had a very clear–and limited–demand. Although they didn’t get it right away, their impact was larger than that demand. Protest politics works in concert, if not coordination, with regular institutional politics. This account is drawn from my book, The Politics of Protest: Social Movements in America. I learned most of this from Lucy G. Barber’s wonderful book, Marching on Washington: The Forging of an American Political Tradition (University of California Press, 2004). This entry was posted in Uncategorized and tagged army, bonus march, DC, Douglas MacArthur, Franklin Delano Roosevelt, Herbert Hoover, occupation, Occupy, police, The Great Depression, unemployment, veterans, Washington. Bookmark the permalink. I heard a story on this on npr tonight with lots of great old sound bites and some old timers recalling the days. I kept thinking this piece of history would make a great movie. That was a great piece, and long–even for NPR (12 minutes, link below). And you’re right, this is the movie! You seem to have had a lapse in memory in that , concerning the Bonus Army ,”Discipline in the camp was good, despite the fears of many city residents who spread unfounded “Red Scare” rumors. Streets were laid out, latrines dug, and formations held daily. Newcomers were required to register and prove they were bonafide veterans who had been honorably discharged. Their leader, Walter Waters, stated, “We’re here for the duration and we’re not going to starve. We’re going to keep ourselves a simon-pure veteran’s organization..’ From Eyewitness of history site. The Occupiers have failed because they, as a rule, did not have the spine or character or experience to disallow those who would cause the focus away from the salient points. Taking a dump on a police car is one of a multitude. It is a shame that the rabble became the show. That is what happens when children..both in time and experience..to run the show. Ah yes..good ole direct democracy…the trash overcomes all else. I recall that General MacArthur burned out the disciplined “simon-pure” Bonus march, as innuendo about crime and communist sympathies circulated. It took an election–and much else–to get the service bonuses paid. You are much too young to recall Doug Out Dug ::))…and your point is taken and it was not mine. My point was and remains that the current protests are a failure for the reasons, in a large part, which I stated above. Do you agree or disagree? You know..ordinary folks are not going to support protestations intermingled with screwing on the street and dumping on the cop car. et al and et al and et al ..Perhaps they have had their 15 minutes…. The bonus Army was disciplined and the current crop of protesters are not….they certainly had/have no ability to discipline their ranks. I agree with the first part of your point, that the Occupiers in some cities haven’t done a very good job at internal control and discipline. I wrote about this previously in the context of a few instances of horrific sexual assaults at some of the camps. Let me amplify: the fetish about internal democracy and consensus has been a substantial handicap to discipline altogether. You mention the picture of the one guy pooping on a police car, but that’s a one-off. A better example is the ongoing problems with limiting the drumming in Zuccotti Park. Apparently, it annoyed the hell out of most people–but not everyone, and consensus was hard to reach and difficult to enforce. So, we agree on the problem. Where we disagree is your contention that the claim made the movement a failure. I think the Occupations were incredibly successful in resetting the political dialogue in the United States, and I don’t think it’s over. I do not think that city officials would have wanted to allow the Occupations to go on forever even if they had been more orderly, cleaner, and better disciplined. (The Occupation in Irvine was, for example, but the City Council members wanted their lawn back [http://blogs.ocweekly.com/navelgazing/2011/12/occupy_santa_ana_backs_off_occ.php].) I’m also reasonably confident that Occupy’s political opponents would have made the same sorts of charges even if the Occupations were “simon-pure” (I like the term). More sustained efforts at internal discipline certainly may have helped with some audiences, and some of the Occupations struggled to do so. The larger longer-lived camps, like Occupy Wall Street, wound up trying to set up committees to manage internal safety and protect the Occupiers from predators within. The bigger points got out nonetheless. And now that the Occupations are gone–mostly–many of the actions are far more disciplined. Thanks you for your reply . The economy seems to be inching upwards and with prosperity the edge might no longer be there in enough of a force to engender a rational petition.It seems to me there is not time in endeavors such as this to have either a representative democratic election process or the frothing fanatics to follow a Lenin or Al Gore. Time will tell for all of these. wonder just much power would be needed to cause a miscreant to cease and desist that an internal security group could actually and physically demonstrate. That is a very very dangerous thing since they would not be under a mantle of legal authority. I can see some creep being detained by an “Occustasi” (could not control myself) and , ending up, being tried for kidnapping. There is nothing wrong with a good ole’ fashioned bayonet charge to dissuade the drummers..a just desert I believe.